That made it two wins out of four for the side coached by Gareth English and Daz Phillips and moved them up to sixth in the Premier Division. All 17 players in the squad contributed to the win. 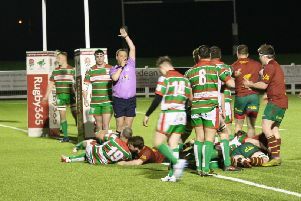 Although the visitors conceded three tries in Cumbria, success was built on solid tackling as the visitors were starved of possession for long periods of the match. The first 20 minutes were dominated by defences with Canaan Smithies, Jack Georgiou and Danny Williams smothering the Kells pack. Siddal threatened on a couple of occasions. Joe Martin combined with Lewis Hosty to take play 60 yards upfield but the chance went begging after four minutes. Three minutes later Gareth Blackburn almost squeezed over the line by the corner flag, but was stopped from grounding the ball by the scrambling Kells defence and was injured in the process. The home side were not short of confidence after beating champions Hunslet in their previous home game, but Siddal were looking the classier team. Henry Turner was a threat in possession and skipper George Ambler was leading from the front alongside Danny Rushworth and Ben Hinsley. 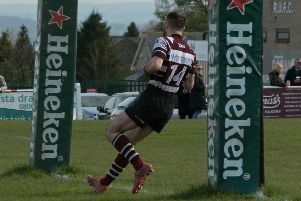 The opening score came after 26 minutes when Gareth English carried out his trademark off-load to Sean McCormack, who was in turn backed up by Chris Brooke. The break spread the home defence and from the resulting play the ball McCormack sold an outrageous dummy and strolled over the line from 25 yards out without a hand being laid upon him. Blackburn’s conversion from under the posts put Siddal 6-0 ahead. Siddal created another great opportunity two minutes later when Brooke and Hosty combined to breach the Kells defensive line. However, the visitors were penalised for backchat when the Kells defender hung on to allow team mates to regain their position and went unpunished. From the resulting penalty Kells put pressure on the Siddal line coming down the slope and Paul Culnean touched down to reduce the deficit to 4-6. The only further score in the opening half came right on half time when Brooke landed a drop goal. Siddal’s defence held out 16 consecutive tackles inside their 25 yard line at the start of the second half as Iain Davies, Dom Booth, Williams and Christian Ackroyd repeatedly repelled the home side. Kells tried to force another repeat set but their kick was collected by Joe Martin who beat the first tackler and fed the ball out to winger Sam Walsh who scorched 85 yards down the touchline to score by the corner flag. Siddal’s 11-4 lead was reduced on 54 minutes when Grant Gainford’s grubber kick from 10 yards saw Siddal slow to react and he touched down unopposed. Brother Ross Gainford’s conversion made it 10-11 and it was now all Kells. The visitors had to withstand a further four defensive sets as they repeatedly dropped out from under the sticks. On a rare spell of possession, man-of-the-match McCormack broke the Kells defence straight up the middle of the pitch and he fed the supporting Hosty who raced clear to score under the posts after 61 minutes. Brooke took over kicking duties from the injured Blackburn and his conversion put Siddal 17-10 ahead. The lead was stretched after 68 minutes when Siddal spread the ball through hands as Ambler, McCormack, Georgiou and Ackroyd found Hinsley in space. He passed to Hosty, who added a clinical finish and Brooke landed an excellent conversion for 10-23. Siddal still had an uncomfortable final 12 minutes, barely holding possession again, and Kells took advantage with a try from winger Daniel Joyce after 75 minutes that was improved by Ross Gainford. The home side crossed the line again with the last play of the game from second rower Callum Kinrade. Siddal’s Yorkshire Men’s League team also gained a season opening win at Chevinedge as Russ Holroyd’s young side beat East Hull 21-10. Try scorers were Matty Prest, Jake Turner, Callum Holroyd and Eddie Ainley. Skipper Tom Hirst landed two conversions and Turner a drop goal. Oliver Lewis at full back was man-of-the-match.